Evolution, we now understand, has provided humans with a powerful toolkit of predispositions that go a long way in explaining our ability to learn language, cooperate successfully in groups, think across problems, plan for the future, and how to empathise with others. Predispositions provide individuals with a whole range of skills that enable them to relate flexibly to their environment. Yet, because for most of human history Man tended to live in relatively small groups, these skills have to be developed collaboratively as very few people ever possess all these attributes. The speed with which our predispositions evolve seems to be incredibly slow, and it is thought there have been no major changes in the last 30,000 years. By melding neurological discoveries in an evolutionary framework researchers can see how within a single generation the influences of millions of years of evolution mingle with the priorities of a particular culture. As was stated graphically by the Harvard Business Review in late 1998 “you can take man out of the Stone Age, but you can’t take the Stone Age out of man.” We are enormously empowered by an array of evolved predispositions which enable us to adapt to vastly different sorts of circumstances, yet these evolved predispositions inhibit us as well. We have to be cautious to devise learning environments that take such predispositions beyond “what comes naturally,” but the evidence is striking — in doing this we must go with the grain of the brain. That “grain” we can now begin to understand far better. The relationship between nature and nurture is well summarised by the English Professor of psychobiology Henry Plotkin in his 1996 book Evolution in Mind. Plotkin notes “nature has itself evolved. Nurture can only be fully understood in light of historical causes. Nature has nurture.” This goes a long way towards explaining just why humans learn the way they do. Harvard’s Howard Gardner uses his theory of multiple intelligences to show that, deep within our minds, we have multiple survival strategies that include an ability to look at any situation from a number of different perspectives — link this with the emerging understanding of how the neural structures of the brain grow, and we begin to get an understanding of how these different forms of intelligence enable each of us “to make sense of our environments in very different ways.” These “different ways” are critical to our species survival, and help provide insight into the origins of creativity. The balance between emotion and logic, the role of intuition, and the relationship between intrinsic and extrinsic motivation are all part of the “complex adaptive system” that best describes the brain’s ability to deal with the messiness of ordinary everyday life situations. Now, consider what we know about the brain and effective learning in light of the many systems developed over the past 150 years to organise individuals within an industrial economy. Prosperity meant organising people into factories where their broadly based skills were not needed and very quickly in support of this school systems were built which emphasised functional transactional skills that only utilised a small proportion of each individual brain. Such underused brains had to find their satisfaction elsewhere, and factory owners were quick to replace intrinsic motivation with extrinsic reward. 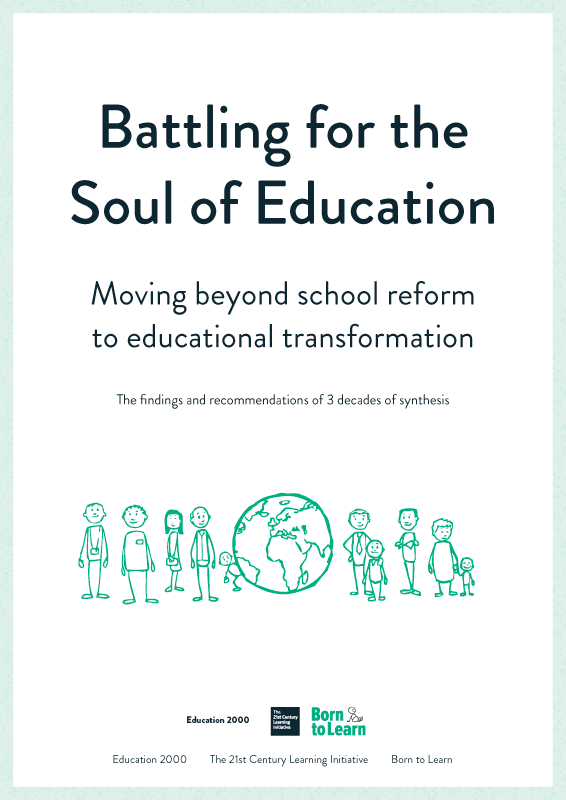 Our present “crisis in schools” partly relates to the collapse of the old factory system and the recognition that successful workers now have to have more than just basic skills and an amenable attitude, which is largely what was required of their parents and grandparents. Things are now very different. As the Pulitzer Prize Winning author Daniel Yergin recently observed “companies are being forced to think differently…That means fostering a culture that encourages alertness, responsiveness, and flexibility, and the speeding up of the cycle time of processes and decisions. In the aftermath of ‘reengineering’ and restructuring, competitive forces now demand a rediscovery of employees and of the knowledge they command…The high-rise pyramids of hierarchical corporate structures are being transformed into the low-rise of the flatter organisation — less bureaucracy, more teamwork, and a greater dispersion of responsibility, information and decision making.” In short, we need people who are competent problem-solvers, creative, flexible and personally responsible for their welfare and the welfare of those in their family and neighbourhood. Research from the evolutionary sciences show that these collaborative higher order skills and attitudes are indeed largely innate. Thus, with only a limited amount of stimulation at an early age (as would have been the case in pre-Industrial times) they quickly develop. Despite six, eight or ten generations of such limited demands being placed on our sense-making skills our genetic inheritance has not yet been modified a jot. Children are still born with latent predispositions, as it were, equipping them to take on the world. During much of this century formal schooling has struggled to provide appropriate simulation of real life situations. It has met inevitably with only limited success.